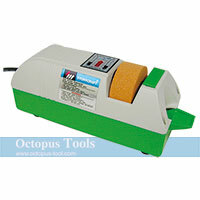 ◆ A useful grinding and buffing tool with variable speed control. 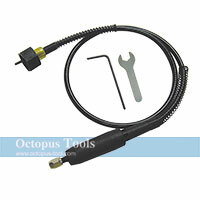 ◆ Delivering high precision when working on small wood or metal objects with a flexible long-arm shaft. 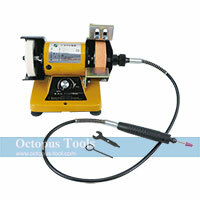 ◆ Also an excellent rotary tool used in deburring, grinding, and buffing. 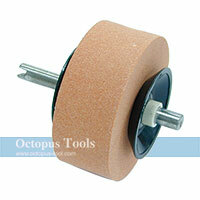 ◆ Includes a 3" aluminum oxide grinding wheel, 3'' wool felt polishing wheel, and a 33.5" long flexible shaft. 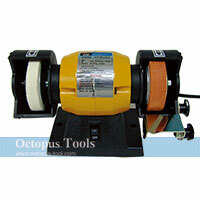 For P/N 253.5005 Mini Bench Grinder and Polisher. ◆ A flexible shaft is your best partner in fine works and allows great maneuverability on small objects. ◆ Use it with rotary tools to create unique and excellent crafts. ◆ This flexible 33.5" arm shaft increase higher precision when you do buffing, grinding, and deburring.